All of these are reasons that you may want a fence. Whether your reason for wanting a new fence for your Clarence, NY home is one, a few, or even all of these reasons, you won't find a better fence company than The Vinyl Outlet. The Vinyl Outlet is a vinyl fencing contractor located in western New York that offers top quality vinyl fencing installed by expert fencing contractors that have years of experience installing vinyl fencing. Most importantly: they can withstand Buffalo winters without a scratch! Our experienced fencing contractors know that, after hundreds of fencing installations in Western New York, vinyl fences are the only ones that don't require maintenance or repair visits. That is why we started only doing vinyl fence installations, and that is how our reputation in Clarence, NY and Western New York grew. That is how we became The Vinyl Outlet, Buffalo's biggest and best fence company! We understand that you are probably planning your fence on a budget. Are you also factoring in maintenance, repair, and cleaning costs; ten years, five years, or even a year or two down the line? With a vinyl fence from The Vinyl Outlet, you don't have to! Vinyl fences can go years, decades without needing any maintenance or repair, and can easily be cleaned with just soap and water. The Vinyl Outlet also always provides a free estimate before any work is done, and our team will work with you to choose a fence that best serves your needs, while staying within your budget. Because we custom build our fences, we have plenty of options that are both attractive and inexpensive. If you need a fencing contractor in Clarence, NY, contact The Vinyl Outlet, the best vinyl fencing company in Western New York, today. Our team will get you started right away. 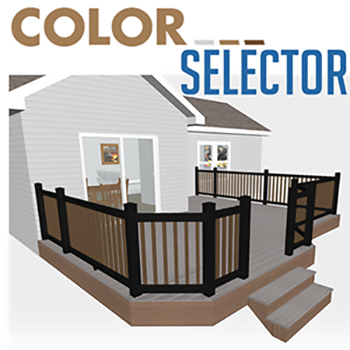 Within an amazingly short time, your Clarence, NY home can be surrounded by a new, bright, modern-looking vinyl fence, that will unquestionably be the talk of the town and the envy of your neighbors! We are the dealer for Veka Deck Products in Buffalo NY. Take a Minute to see why Veka Deck is right for your next deck and why only The Vinyl Outlet can get your quality like VEKAdeck PRO technology. VEKAdeck™ PRO does not contain organic or cellulosic ingredients which may allow mold growth or degradation. VEKAdeck™ PRO contains pure PVC and non-organic fillers and stabilizers. Environmentally Friendly- PVC is recyclable and saves our precious forest resources. Because VEKAdeck™ PRO is UV and water resistant, chemical treatments are not necessary. "I appreciated chatting with them after the job was completed. They are fine young men with a tremendous work ethic and commitment to making things right for the customer. They are great representatives of the Vinyl Outlet! I highly recommend this team for your next installation!" "I would not hesitate to recommend them to family and friends! Great job"
"I would like to commend the work ethics of Brandon and his crew. They just completed our deck and we were very impressed with the construction of the base and the final outcome. During the course of construction they conducted themselves in a very professional and dedicated manner." Sign up for our monthly newsletter for DIY tips, news and specials!